Notes: Based on webcomic by ONE, published in Ura Sunday. 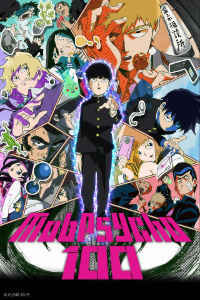 Despite its title, this show is NOT about a demented yakuza; it is, instead, about a middle school student nicknamed Mob (real name Shigeo Kageyama) with incredibly powerful esper abilities who wants to lead a normal school life, despite exploitation by his "senpai" ( a fake exorcist named Reigen Arataka); despite the issues his "perfect" brother Ritsu has with him; despite the weirdos, human and not, that want to hang out with him (and ALSO use his abilities for their own benefit, like Reigen does); and despite some bona fide villains. He's remarkably laid back and calm, but when his stress level finally does build to 100% (this is where the "100" in the title comes from, and it's actually tracked during the show), he can lose complete control of his powers. ...and THEN the show LOST ITS NERVE, and gave us a final Third Act that revived the old chestnut of the "evil organization that wants to exploit our gifted youngsters". It's a MUCH too well-trodden path (by shows like Himawari Too! and their ilk) to really engage me, and while there are plenty of battles (action fans won't be disappointed), I just couldn't really get "into" this final story arc, especially since it ends in what I consider a muddled and (even for a show like this!) implausible fashion. Recommended Audience: Fantasy violence, though no blood. There's absolutely no female exploitation (fan service) in the show; in fact, the only female character that gets a fair amount of time at all in the show is the long-suffering president of the Telepathy Club.